Definition at line 26 of file RockHeaderUpdater.h. 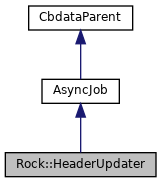 Definition at line 20 of file RockHeaderUpdater.cc. Definition at line 34 of file RockHeaderUpdater.cc. References AsyncJob::doneAll(), reader, and writer. Referenced by HttpStateData::abortAll(), Ftp::Client::abortAll(), Comm::TcpAcceptor::acceptOne(), Adaptation::Ecap::XactionRep::adaptationAborted(), Adaptation::AccessCheck::callBack(), AsyncJob::callException(), Security::PeerConnector::connectionClosed(), HttpStateData::continueAfterParsingHeader(), Ftp::Client::ctrlClosed(), Adaptation::Iterator::handleAdaptationBlock(), Adaptation::Iterator::handleAdaptationError(), Log::TcpLogger::handleClosure(), Adaptation::Icap::Xaction::handleCommClosed(), Http::Tunneler::handleConnectionClosure(), Mgr::Forwarder::handleError(), Ipc::Forwarder::handleError(), Ipc::Forwarder::handleException(), Ipc::Inquirer::handleException(), HttpStateData::handleMoreRequestBodyAvailable(), Ipc::Inquirer::handleRemoteAck(), Ipc::Forwarder::handleTimeout(), HttpStateData::httpStateConnClosed(), HttpStateData::httpTimeout(), Comm::ConnOpener::noteAbort(), Adaptation::Icap::ModXact::noteBodyConsumerAborted(), Snmp::Forwarder::noteCommClosed(), Snmp::Inquirer::noteCommClosed(), Mgr::Inquirer::noteCommClosed(), Mgr::Forwarder::noteCommClosed(), Mgr::StoreToCommWriter::noteCommClosed(), Adaptation::Icap::Xaction::noteCommRead(), noteDoneReading(), Adaptation::Iterator::noteInitiatorAborted(), Adaptation::Icap::Xaction::noteInitiatorAborted(), Adaptation::Ecap::XactionRep::noteInitiatorAborted(), HttpStateData::readReply(), Comm::ConnOpener::sendAnswer(), Rock::Rebuild::start(), Security::PeerConnector::start(), HttpStateData::start(), Ipc::UdsSender::timedout(), and HttpStateData::wroteLast(). Definition at line 153 of file RockHeaderUpdater.cc. References debugs, Must, AsyncJob::mustStop(), reader, and writer. Definition at line 222 of file RockHeaderUpdater.cc. References debugs, doneAll(), Ipc::StoreMapUpdate::fresh, Must, reader, Rock::IoState::splicingPoint, Ipc::StoreMapUpdate::Edition::splicingPoint, store, update, Rock::IoState::writeableAnchor_, and writer. Definition at line 111 of file RockHeaderUpdater.cc. References SBuf::append(), Rock::HeaderUpdater::IoCbParams::buf, bytesRead, debugs, exchangeBuffer, SBuf::length(), Must, parseReadBytes(), SBuf::rawAppendFinish(), readerBuffer, Rock::HeaderUpdater::IoCbParams::size, and stopReading(). Definition at line 240 of file RockHeaderUpdater.cc. References StoreMetaUnpacker::checkBuffer(), SBuf::consume(), debugs, exchangeBuffer, headersEnd(), SBuf::length(), Must, SBuf::rawContent(), readMore(), staleSwapHeaderSize, startWriting(), and stopReading(). Definition at line 128 of file RockHeaderUpdater.cc. References bytesRead, CallJobHere1, SBuf::clear(), data, debugs, Must, NoteDoneReading, noteDoneReading(), NoteRead, SBuf::rawAppendStart(), reader, readerBuffer, store, and storeRead(). Referenced by parseReadBytes(), and startReading(). Definition at line 63 of file RockHeaderUpdater.cc. References Ipc::StoreMapUpdate::entry, Ipc::StoreMapUpdate::fresh, Must, Ipc::StoreMapUpdate::stale, startReading(), and update. Definition at line 72 of file RockHeaderUpdater.cc. References Ipc::StoreMapUpdate::entry, NoteDoneReading, reader, readMore(), store, and update. Definition at line 167 of file RockHeaderUpdater.cc. References CallJobHere1, SBuf::clear(), StoreIOState::close(), MemBuf::content(), MemBuf::contentSize(), data, debugs, Ipc::StoreMapUpdate::entry, exchangeBuffer, MemObject::getReply(), StoreEntry::getSerialisedMetaData(), SBuf::length(), StoreEntry::mem_obj, Must, NoteDoneWriting, noteDoneWriting(), HttpReply::pack(), SBuf::rawContent(), Rock::IoState::staleSplicingPointNext, staleSplicingPointNext, store, MemObject::swap_hdr_sz, update, StoreIOState::write(), writer, StoreIOState::wroteAll, and xfree. Definition at line 83 of file RockHeaderUpdater.cc. References buf, CallJobHere1, StoreIOState::close(), data, debugs, Must, NoteRead, noteRead(), reader, StoreIOState::readerDone, Rock::IoState::splicingPoint, Ipc::StoreMapUpdate::Edition::splicingPoint, Ipc::StoreMapUpdate::stale, Rock::IoState::staleSplicingPointNext, staleSplicingPointNext, and update. Referenced by noteRead(), and parseReadBytes(). Definition at line 40 of file RockHeaderUpdater.cc. References StoreIOState::close(), Ipc::StoreMapUpdate::fresh, reader, StoreIOState::readerDone, Ipc::StoreMapUpdate::stale, store, AsyncJob::swanSong(), update, Rock::IoState::writeableAnchor_, writer, and StoreIOState::writerGone. Definition at line 69 of file RockHeaderUpdater.h. Referenced by noteRead(), and readMore(). Definition at line 68 of file RockHeaderUpdater.h. Referenced by noteRead(), parseReadBytes(), and startWriting(). Definition at line 48 of file RockHeaderUpdater.h. 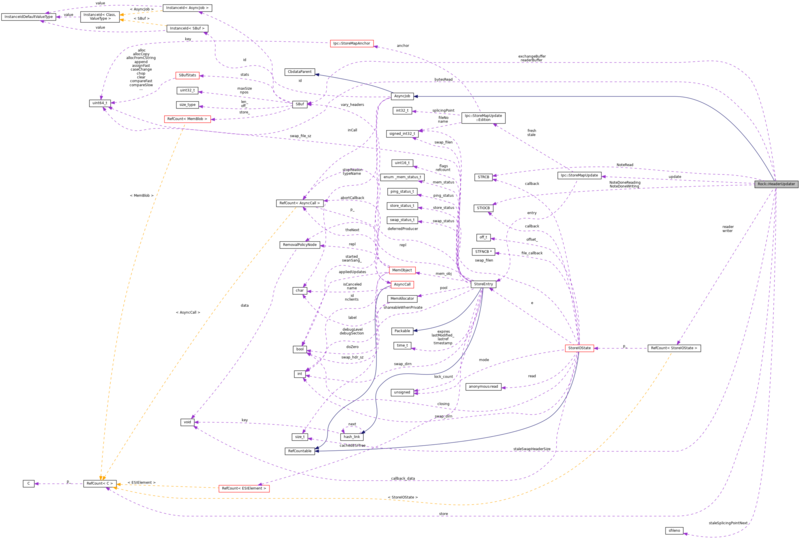 Referenced by readMore(), and startReading(). Definition at line 49 of file RockHeaderUpdater.h. Definition at line 47 of file RockHeaderUpdater.h. Referenced by readMore(), and stopReading(). Definition at line 64 of file RockHeaderUpdater.h. Referenced by doneAll(), noteDoneReading(), noteDoneWriting(), readMore(), startReading(), stopReading(), and swanSong(). Definition at line 67 of file RockHeaderUpdater.h. Definition at line 73 of file RockHeaderUpdater.h. Referenced by startWriting(), and stopReading(). Definition at line 71 of file RockHeaderUpdater.h. Definition at line 61 of file RockHeaderUpdater.h. Referenced by noteDoneWriting(), readMore(), startReading(), startWriting(), and swanSong(). Definition at line 62 of file RockHeaderUpdater.h. Referenced by noteDoneWriting(), start(), startReading(), startWriting(), stopReading(), and swanSong(). Definition at line 65 of file RockHeaderUpdater.h. Referenced by doneAll(), noteDoneReading(), noteDoneWriting(), startWriting(), and swanSong().